Zeb was on a battlefield. And I survived! 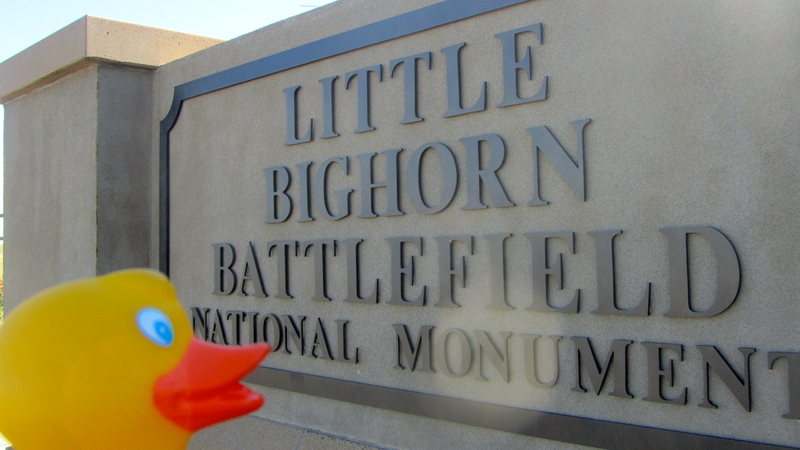 Mom and I stopped at Little Bighorn Battlefield in Garryowen, Montana. 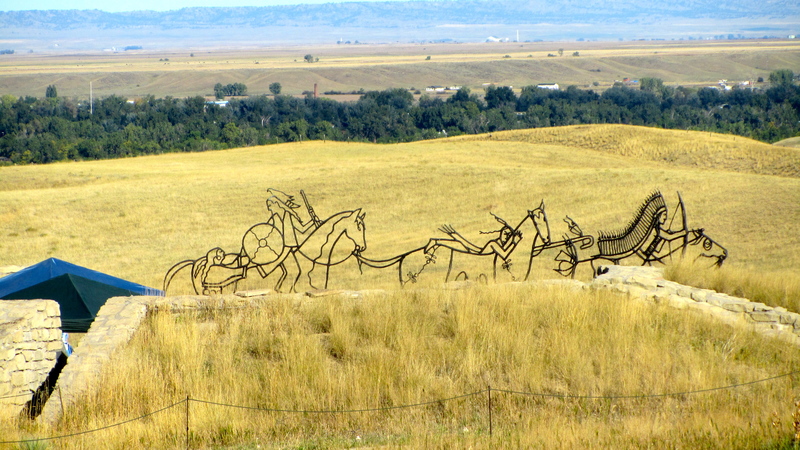 The battlefield is just off I-90 in southern Montana. 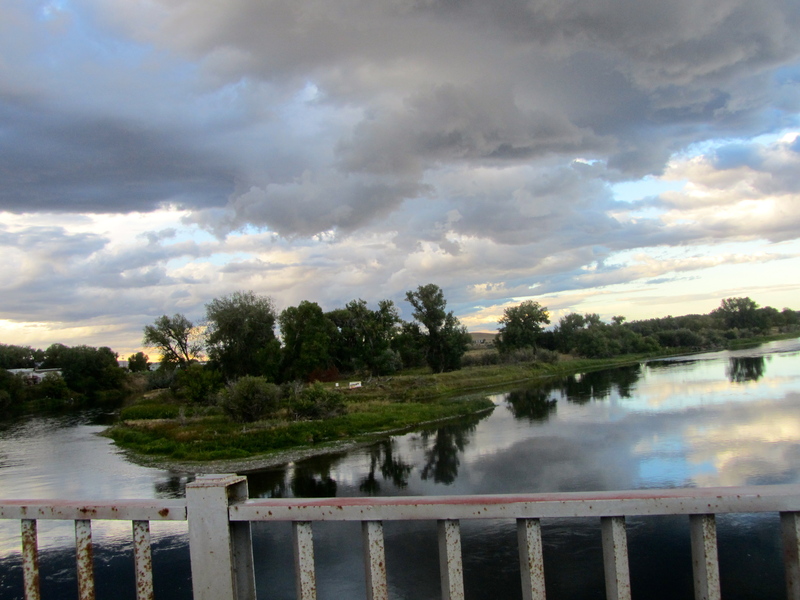 This battlefield is on the Little Bighorn River and is a national monument. Some describe this battle as a clash of cultures. General George A. Custer, 36 years old and a Civil War hero, led 263 soldiers in a battle to defeat the Indians. The battle did not go well for General Custer. He and his men were defeated and killed by over 3,000 Indian warriors. 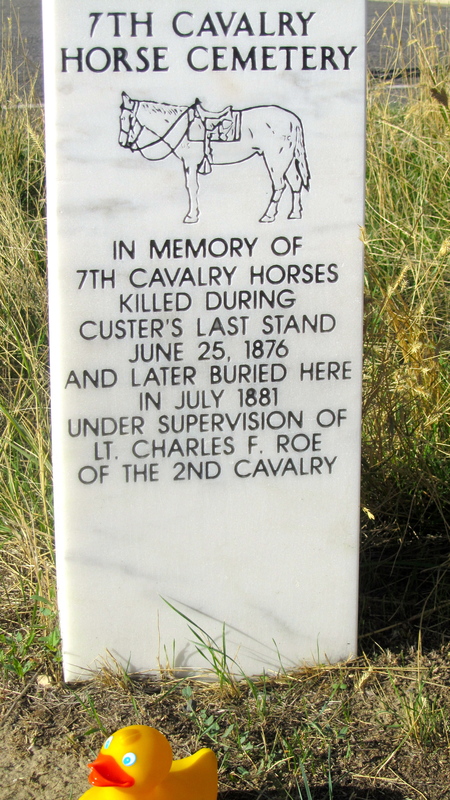 Unfortunately for Custer, this defeat overshadowed his military career, and all many Americans remember about him was that he was defeated and killed here. He initiated the battle against the Indians, even though he was greatly out numbered. (I believe that is an understatement) Many believe that his defeat was the result of his ego. and watched a movie about the battle. Then we walked to Last Stand Hill. 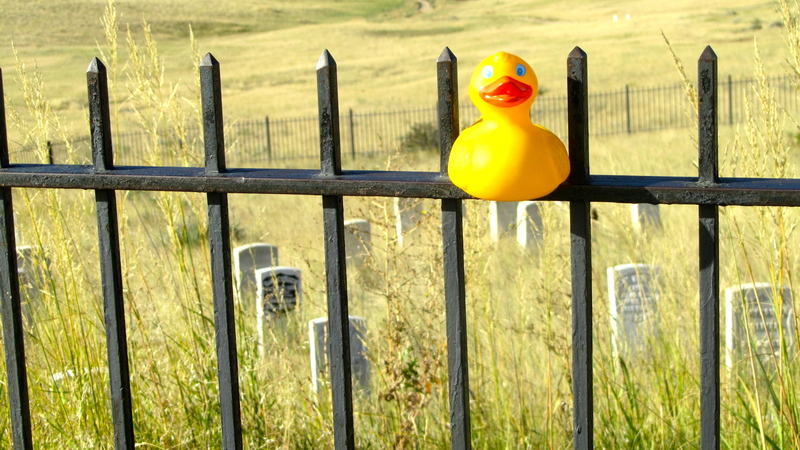 Here is a small cemetery where General Custer, his brother Tom and 39 other soldiers have stone markers. 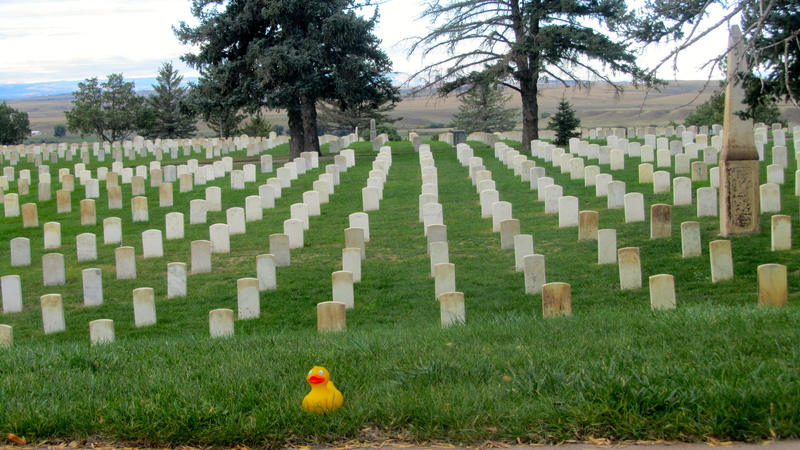 General Custer’s grave marker is the black one, left of me. There is a memorial on this hill. Some U.S. soldiers are buried under the memorial. Their names are carved on the memorial. Near Last Stand Hill there is a marker for the horses that were killed here. I love when humans give credit to the animals! 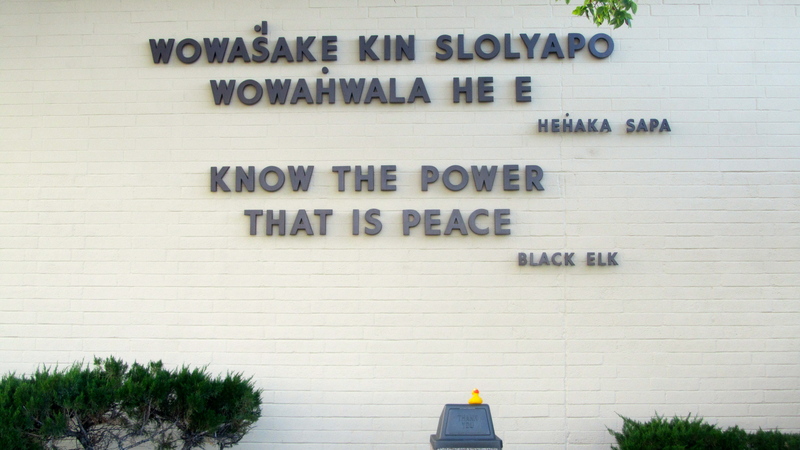 showing where Cheyenne and Lakota warriors died. There are many more white markers than red ones. Near Last Stand Hill an Indian memorial is being built. It is not finished so we were not allowed inside the area. However, the wire sculpture was partially visible. The memorial will be very nice when completed. I hope I can come back to see the finished project. A park volunteer told us that this was the last battle won by the Indians. We walked along trails through the battlefield. 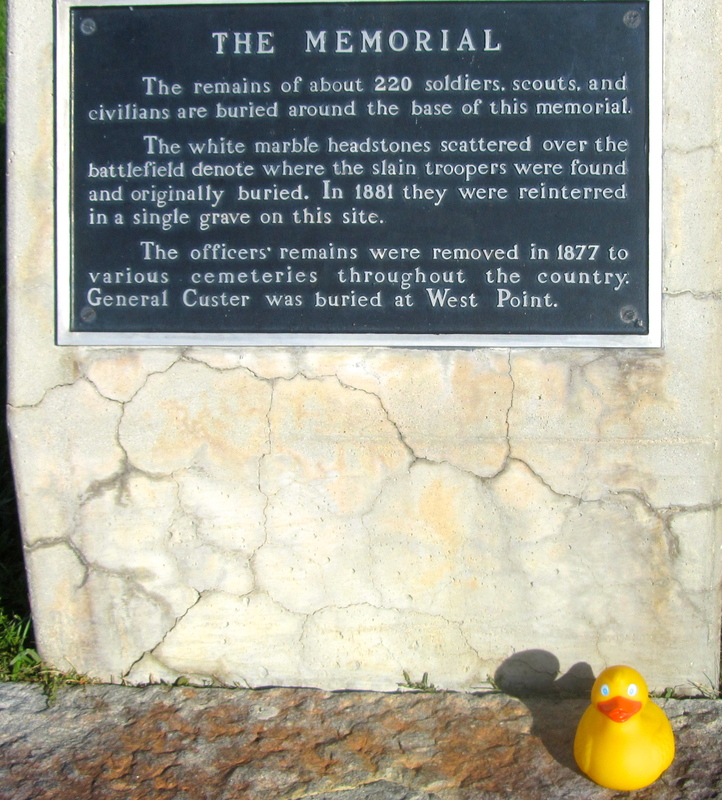 It was strange to see so many markers and know that soldiers and warriors died here. This land has open fields, hills and valleys with many place to attack without being seen and areas of trees by the Little Bighorn River. Lots of places where you cannot easily be seen. Next we drove along a 5-mile road. This road took us to various sections where the battle raged. We saw lots of grave markers. We saw the river, the hills and valleys, the steep ravines and much more. This land is important to all people. 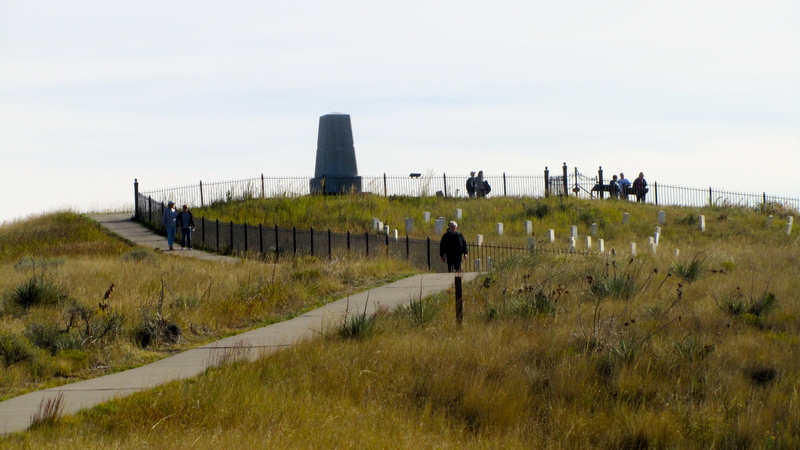 Many remember the soldiers that died here in June 1876 and many remember the Indians that died here. For many Indian tribes, this is sacred land. 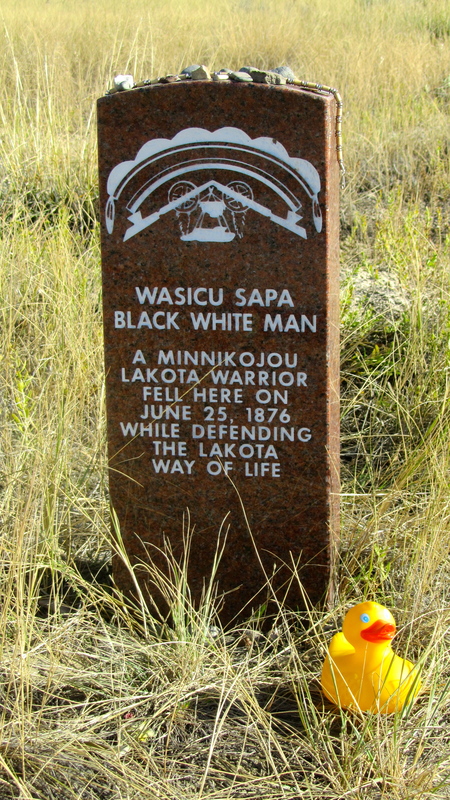 This battlefield is located on the Crow Reservation. 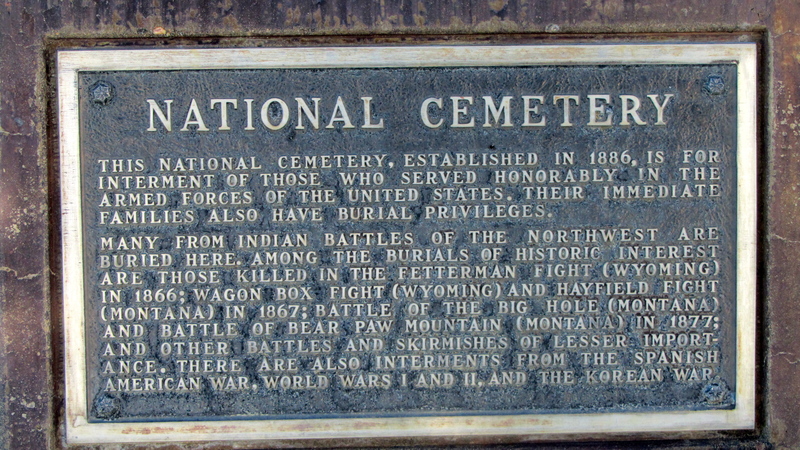 Also located on the Little Bighorn Battlefield ground is a National Cemetery. The rows of grave markers look just the cemetery in Arlington, Virginia. Lewis and Clark were the first explorers to mention Giant Springs. 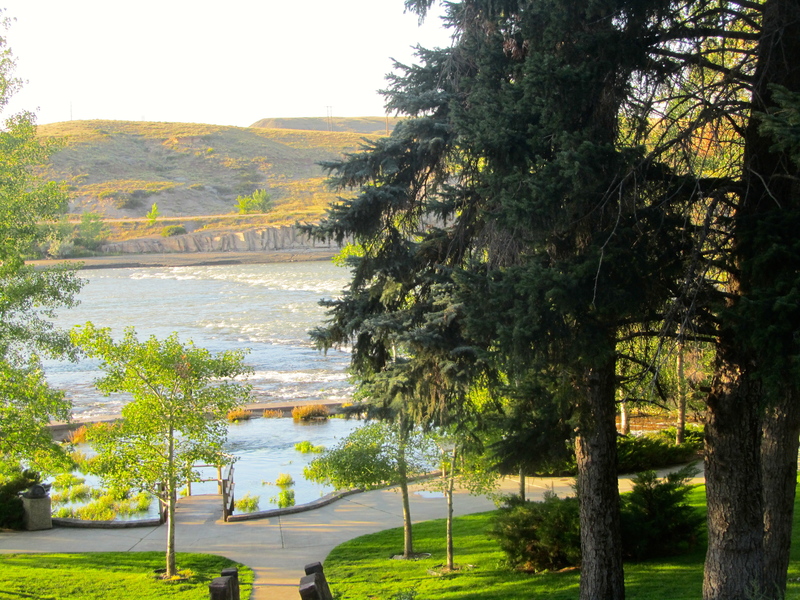 Lewis and Clark followed the Missouri River through this part of Montana. Clark first wrote of the springs on June 18, 1805. He said this was the largest fountain or natural springs he ever saw and that the water was very clear. Lewis described the springs as a “beautiful fountain”. 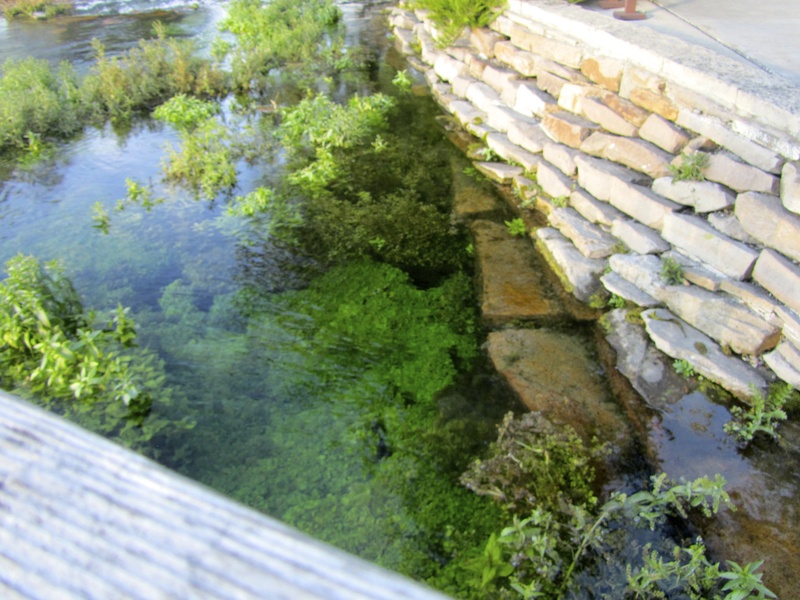 Giant Springs State Park has one of the world’s largest fresh water springs and according to Guinness, the world’s shortest river. Water from the springs emerges at 54 degrees all year. 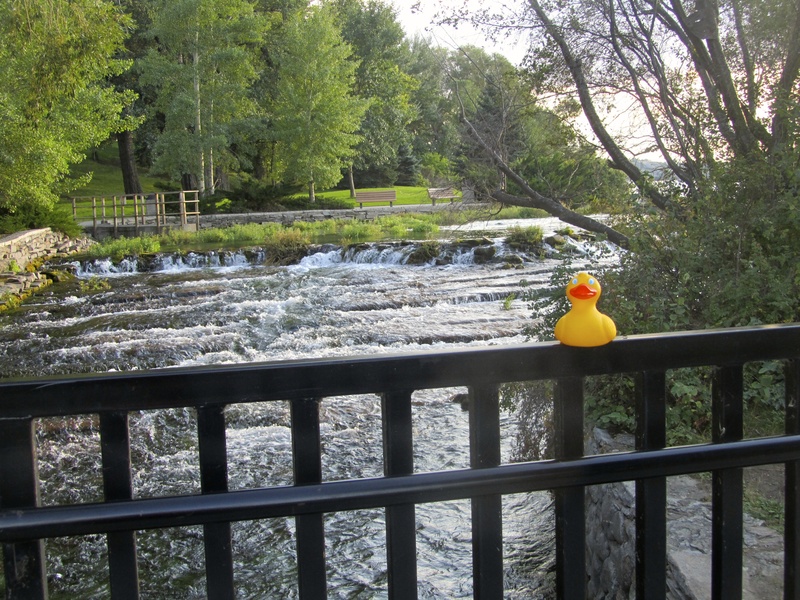 From the springs, the water passes through a pool, over rapids, under a bridge and into the Missouri River. From the springs to the Missouri, this shortest river, the Roe River, is 201 feet long. Lewis and Clark reported that beaver were plentiful and within years the area had many fur trappers and fur traders. 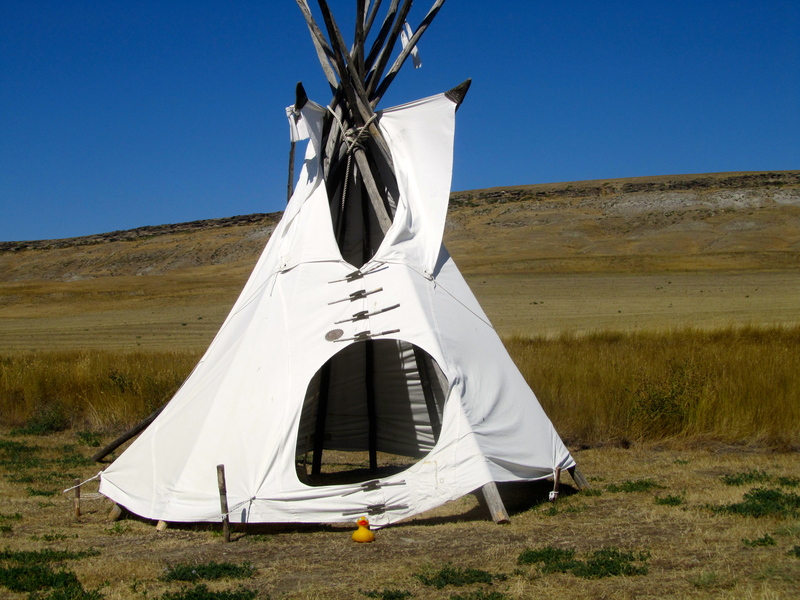 Because of the warm springs, this was also a popular campsite for American Indians. The springs provide lots of warm water– over 150 million gallons of water every day, which flows into the Missouri River. That’s a lot of water! It does not freeze, but I have become accustomed to swimming in much warmer water. However, there are several live versions of my kind swimming here. 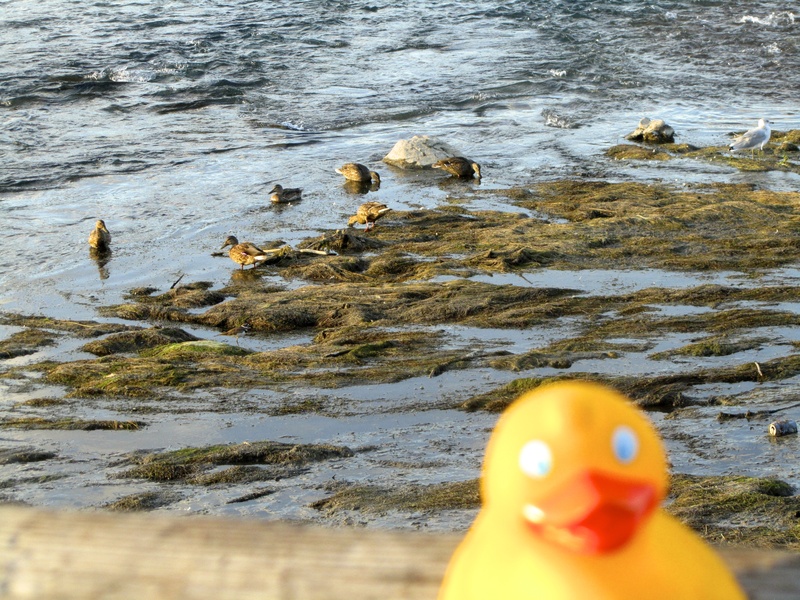 All the ducks love this place. 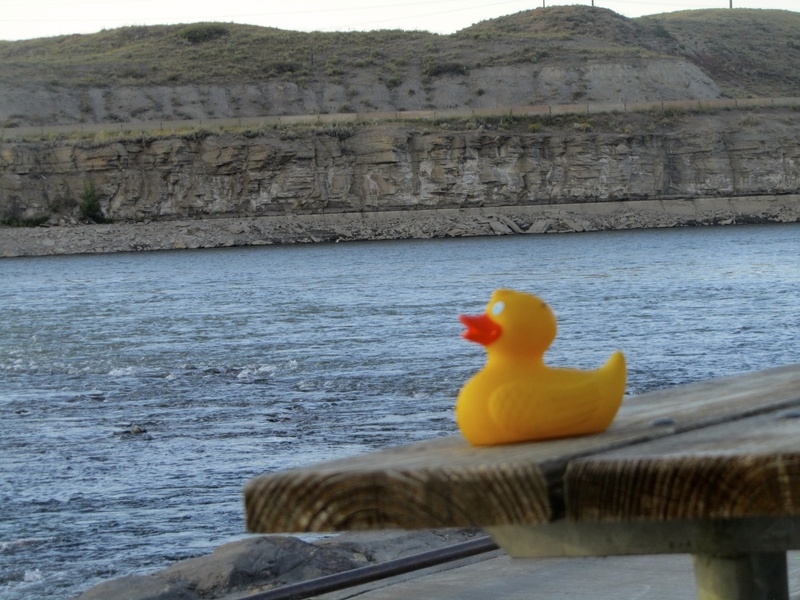 The Missouri River cuts through rock as shown in this picture with me. 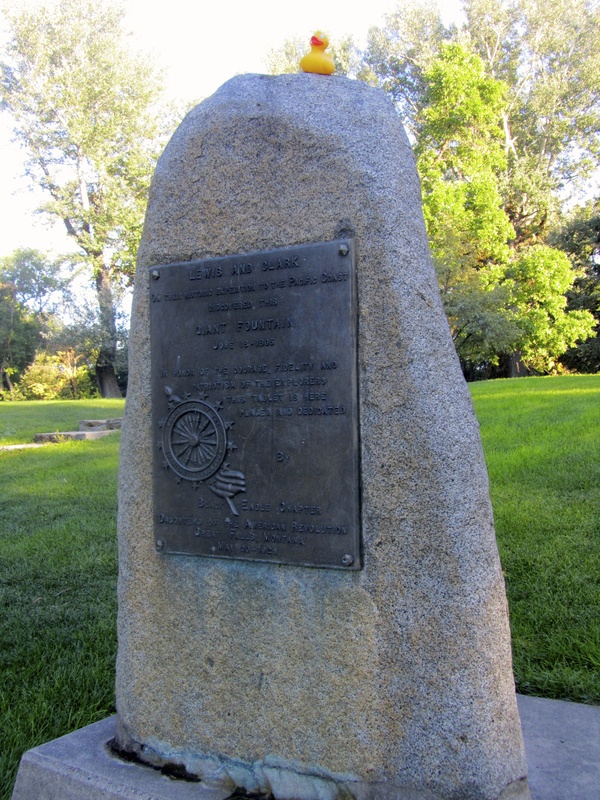 On a hill above the river is a monument to Lewis and Clark. of the springs and Missouri River are breathtaking. The city of Great Falls gave this park to the state and in 1970 Giant Springs State Park was formed. located in Great Falls, Montana. It is big and the grassy lawn even has cannons. A sign on a cannon says it was donated, by Congress, to the Soldiers Memorial Committee. 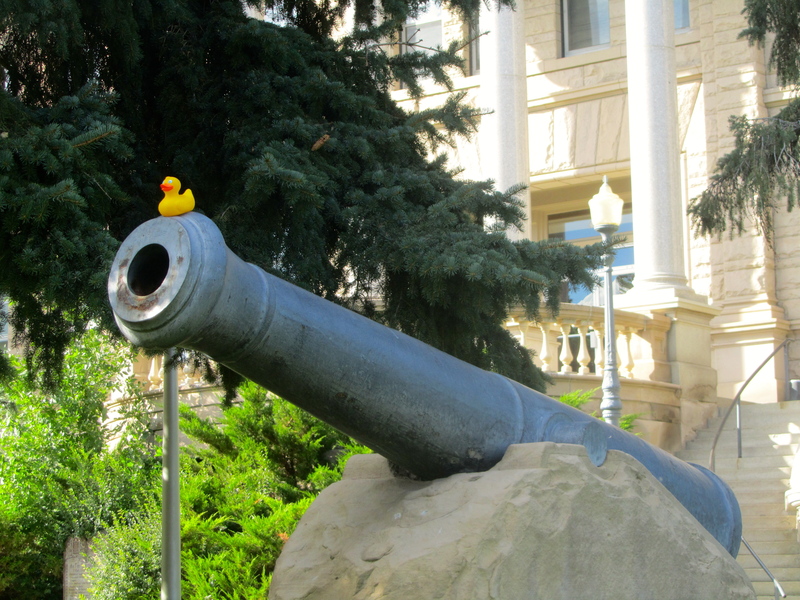 I got to sit on the cannon. Again I feel so little. 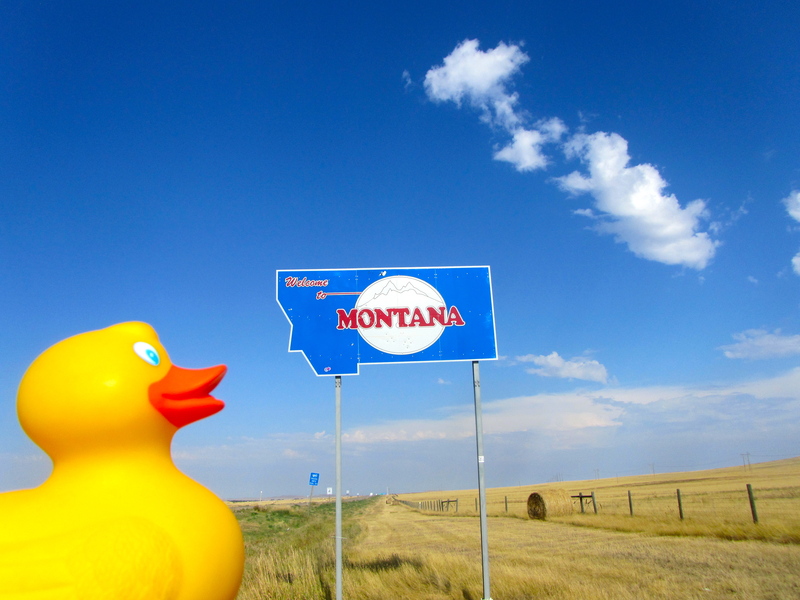 From Great Falls, we drove about 10 miles southwest on I-15 to Ulm, Montana. 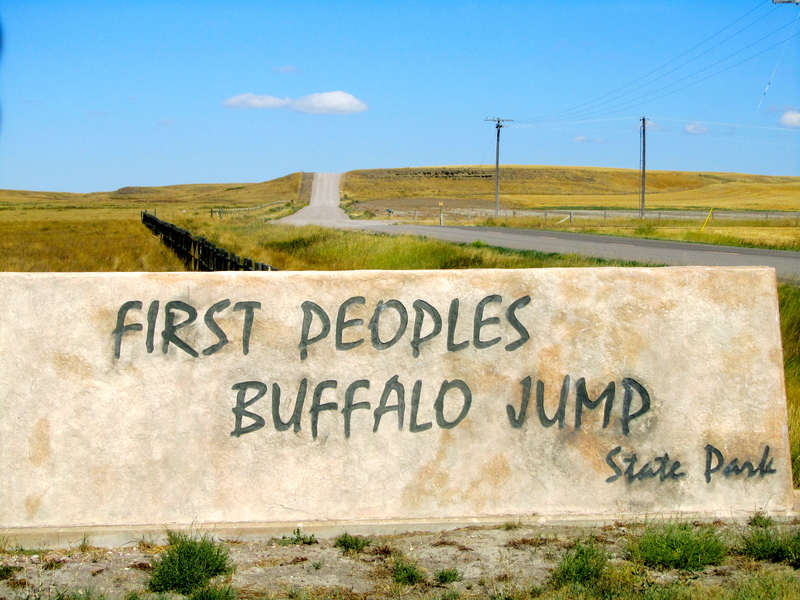 First Peoples Buffalo Jump State Park is located here. I had no idea what a buffalo jump was. Now I know and you will too, in a minute. 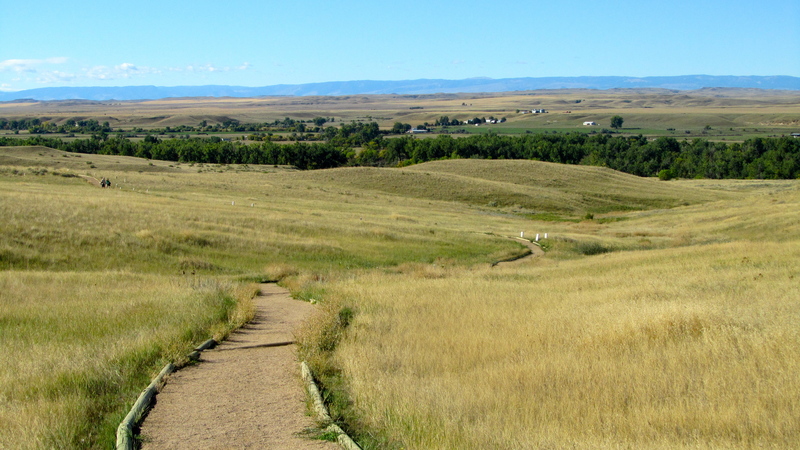 This buffalo jump is one of the most significant in the world. WOW! The American Indian did not have horses for many years, so hunting buffalo was difficult. The buffalo jump was used by American Indians to kill buffalo, necessary for the survival of the American Indian tribes. The buffalo are stampeded off the cliff to their death. Other Indians waited with spears to kill those that did not die from the fall. The entire camp worked on the buffalo to preserve meat, prepare hides, and use bone and horns. The Indian used all parts of the buffalo. History tells us that at least 14 tribes used this site to kill buffalo. This hill is about 1 mile wide and 2 miles long. One side is sloped so buffalo can be herded up the hill. The stampeding buffalo jumped 40-60 feet to their death. Below the cliffs that stretch more than a mile, the soil reveals compacted bison bones nearly 13 feet deep. 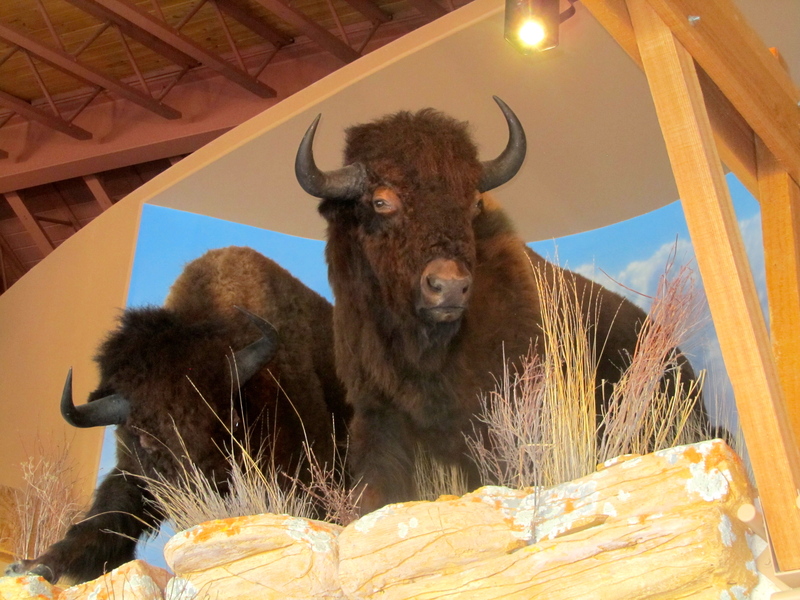 The visitor’s center has a museum and several displays on the walls showing how tribes camped here during the times of the buffalo stampede so they could prepare the buffalo for their use. 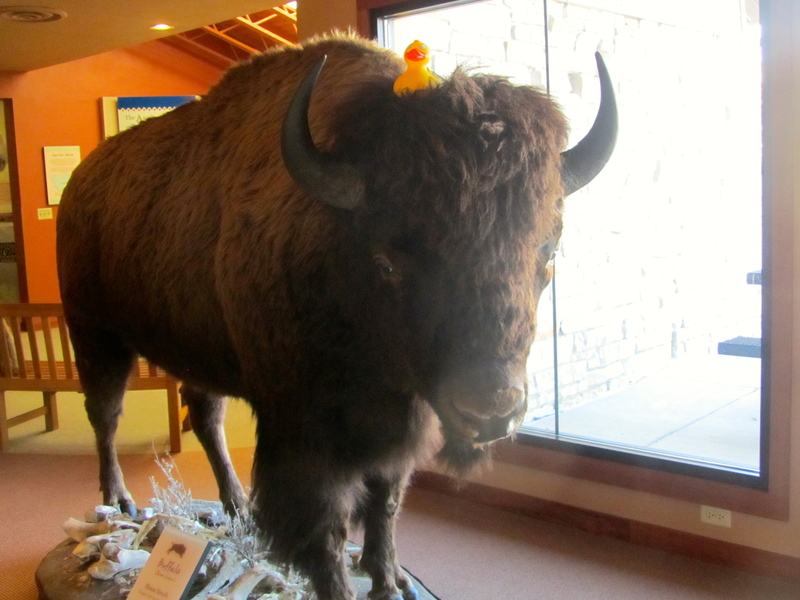 There are also stuffed buffalo on display. and the staff was very helpful. I am just happy that I was not a buffalo at that time. For more information visit www.stateparks.mt/gov or www.lewisandclarktrail.com Also, Wikipedia has information and facts on this site, formerly known as Ulm Pishkun Buffalo Jump State Park. Next time I will tell you about my visit to another Montana State Park. One with lots of water. Early this morning we were on the road again. From Spearfish, SD we drive north to Belle Fourche, then cut across a corner of Wyoming and then into Montana. The sky is already bigger than any I have ever seen. I am going to like Big Sky Country. We enter at Alzada, MT. 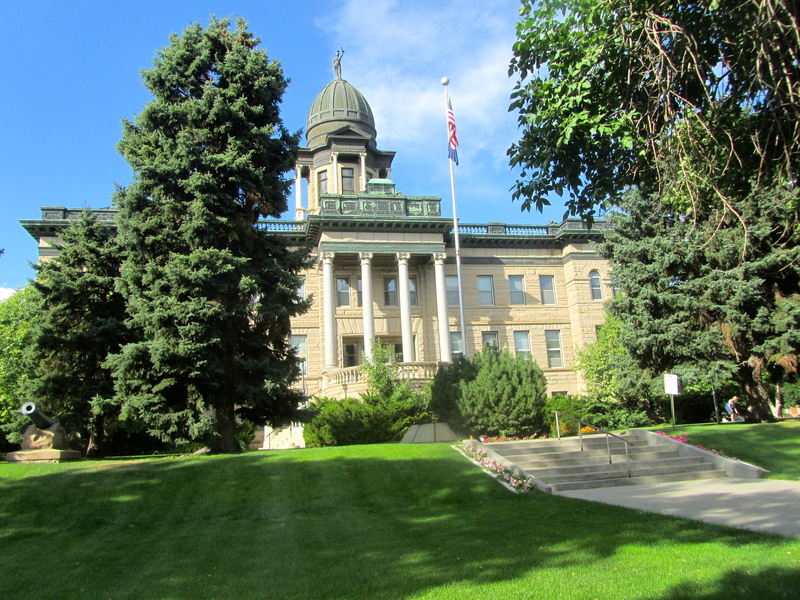 We drive through Billings, head north on Hwy 3 and before Lewiston, MT we enter Judith Gap. This town has a wind farm. The wind turbines are on each side of the road, so we can see them clearly. 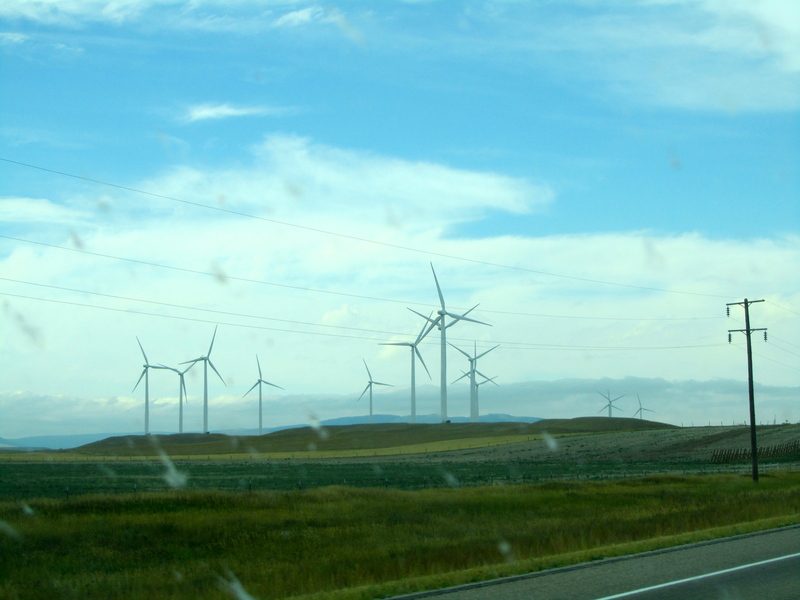 The turbines begin spinning at 6 mph and shut off at 56 mph. There are 90 wind turbines in this wind energy center. 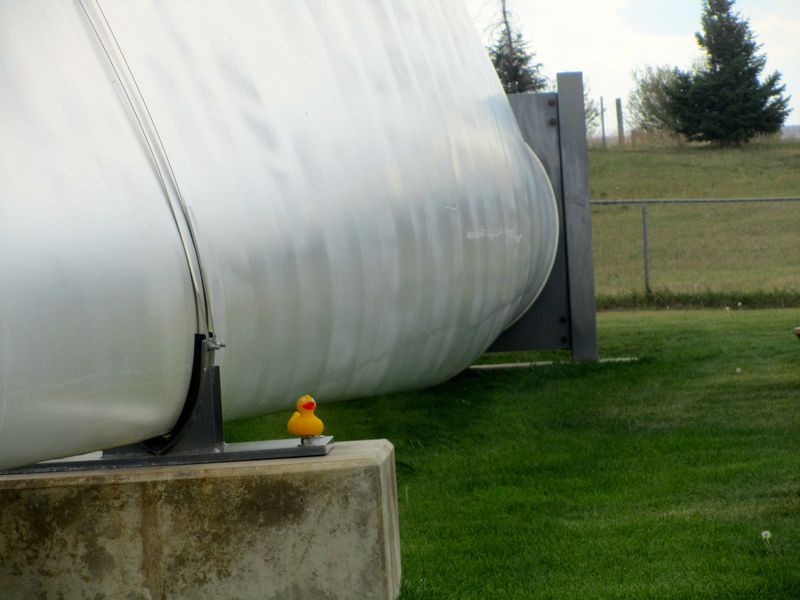 Each turbine produces enough energy to power 350-400 homes. In town, there is a park with one arm of a wind turbine on the ground. It is big. 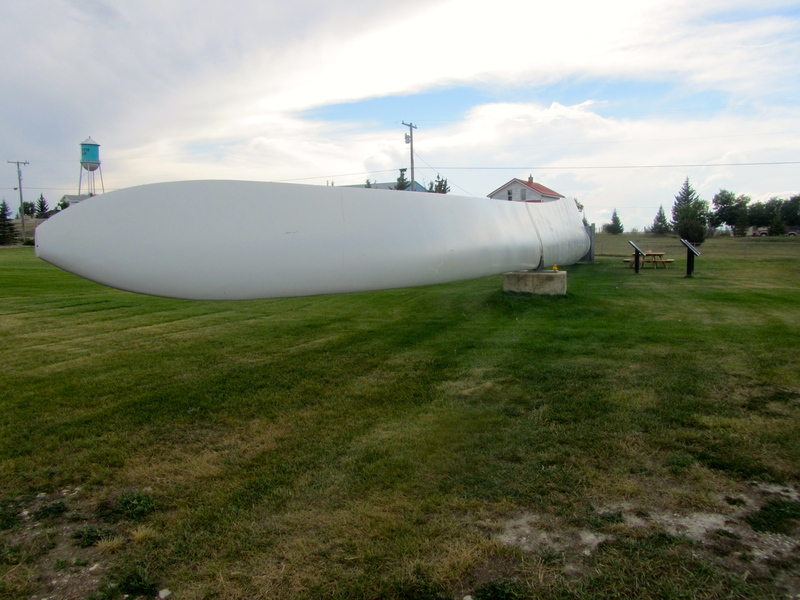 Each blade is 126 feet long and made of fiberglass and epoxy resin. I feel tiny. When the turbines are assembled, the top blade reaches about 400 feet in the air. This blade on the ground incurred internal damage during construction and Invenergy donated it to the town of Judith Gap for this display. 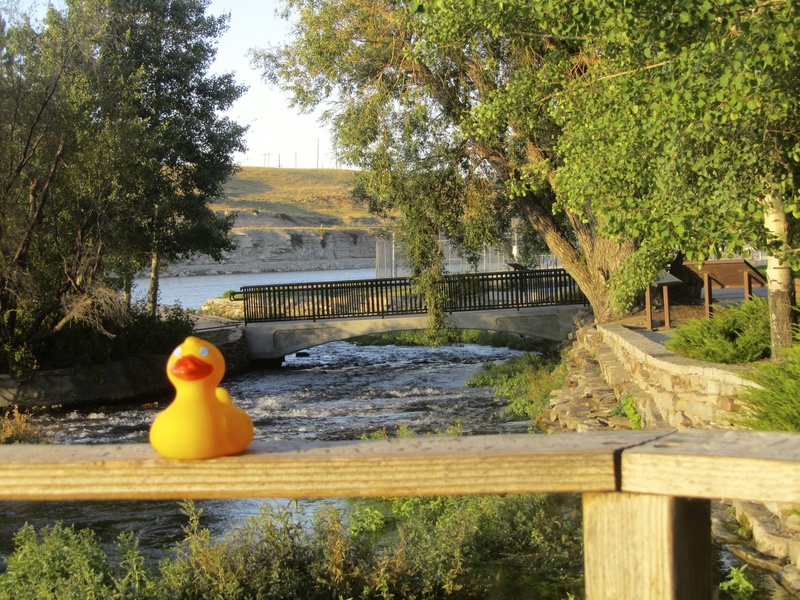 Zeb and the humans stayed in Great Falls, MT a couple days. Much of our time was spent on business in Cascade. Cascade is about 20 minutes west of Great Falls. I-15 from Great Falls to Cascade passes Square Butte. 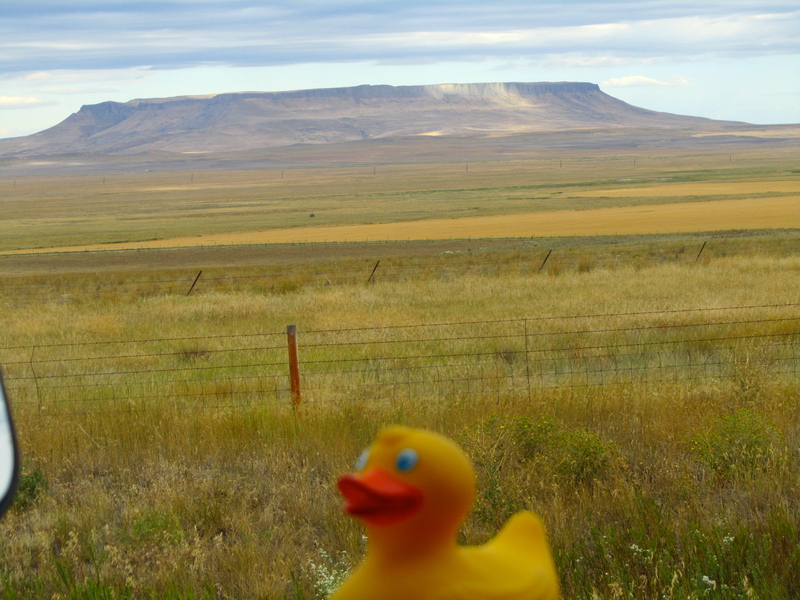 This isolated butte was included in several paintings by cowboy artist Charles M. Russell, and it is now a famous Montana landmark. And I saw it several times! While mom’s friend was busy, we walked around town. 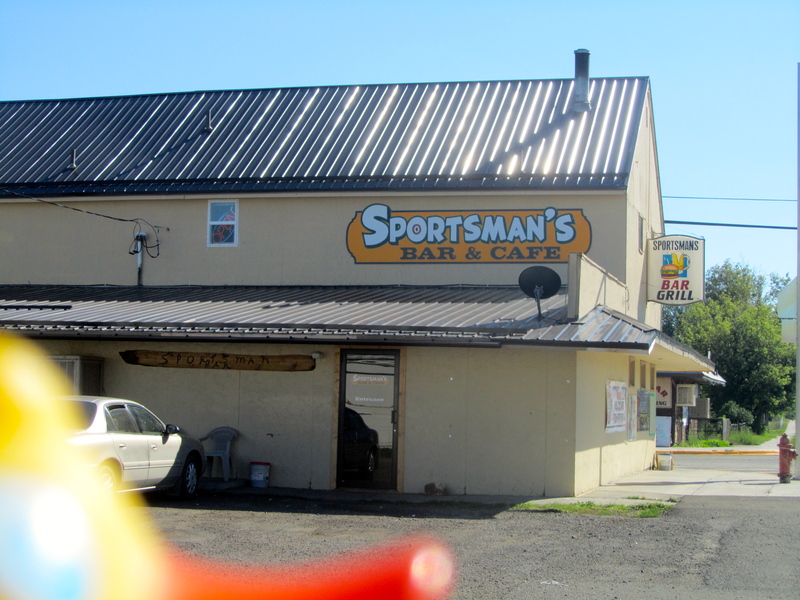 This is Sportsman’s Bar & Café where we had lunch. Hamburgers and Reuben sandwiches. Very good. Makes me hungry remembering. Cascade is rural Montana and people reuse buildings, they don’t tear them down to build another. 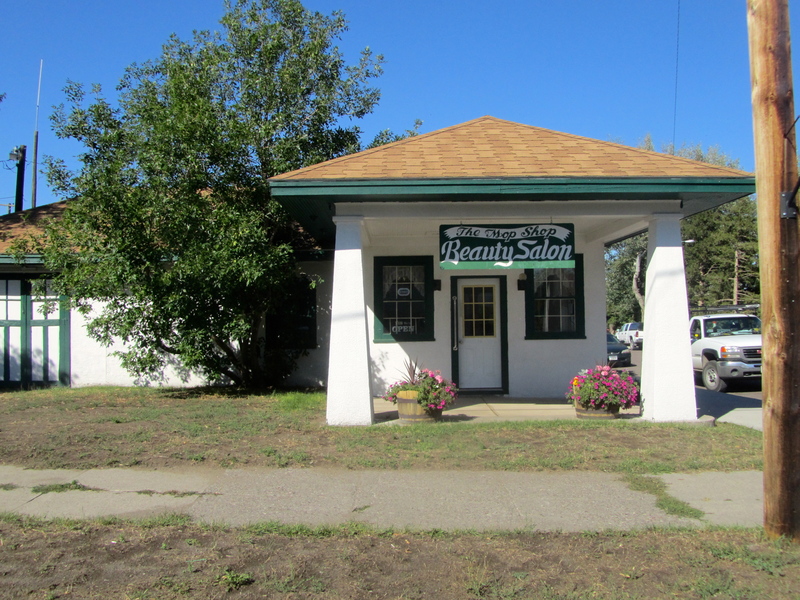 This former service station is now a beauty shop. 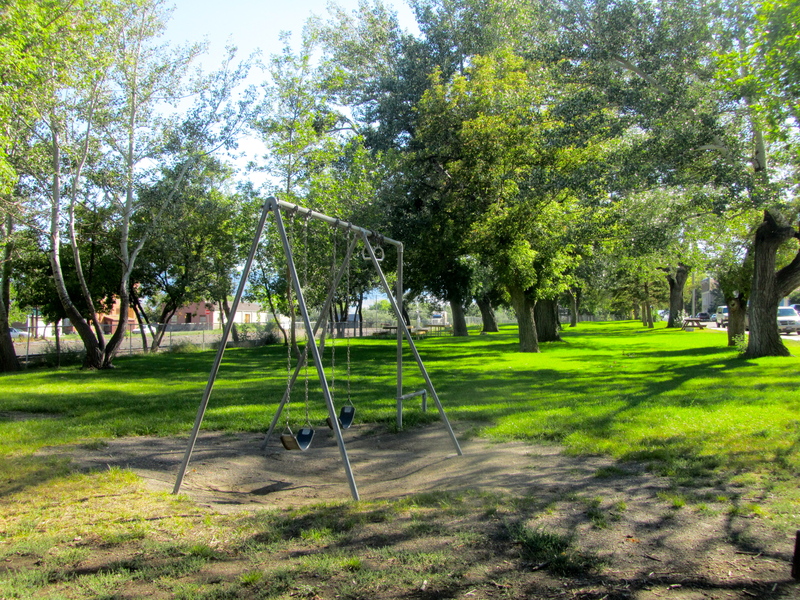 (I played there for awhile) and a large grassy area. Looked perfect for family picnics and games. 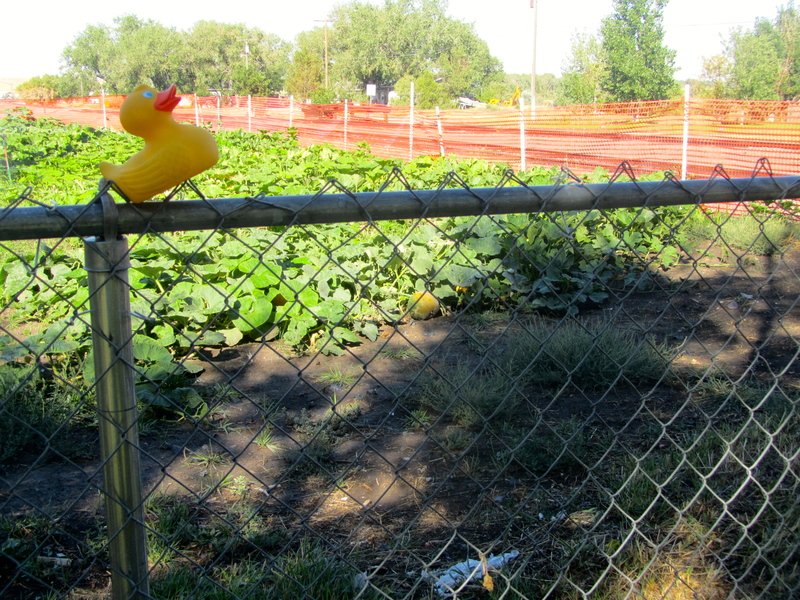 On the edge of the park we saw a pumpkin patch. 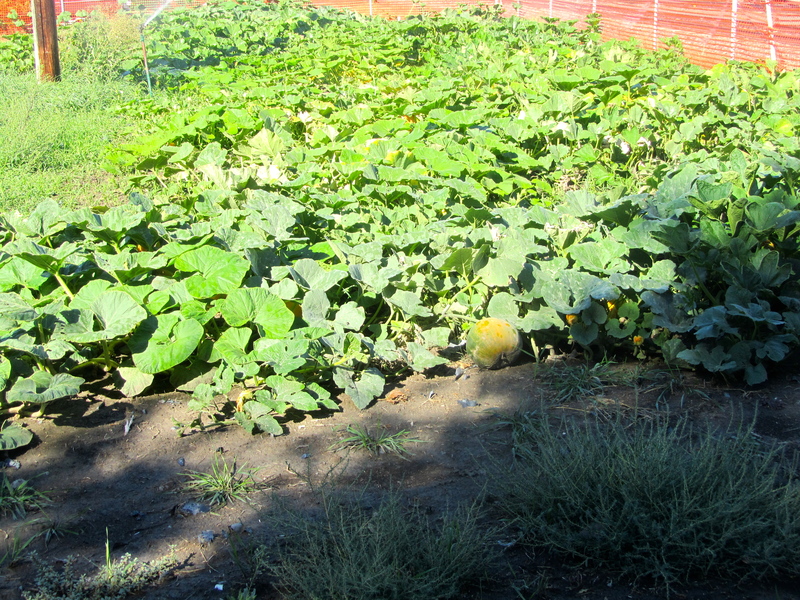 Those pumpkin plants wander all over the area. They will be bright orange for Halloween. Some may be pies and some carved for jack-o-lanterns. This will be my first Halloween. I will give you the duck perspective later. 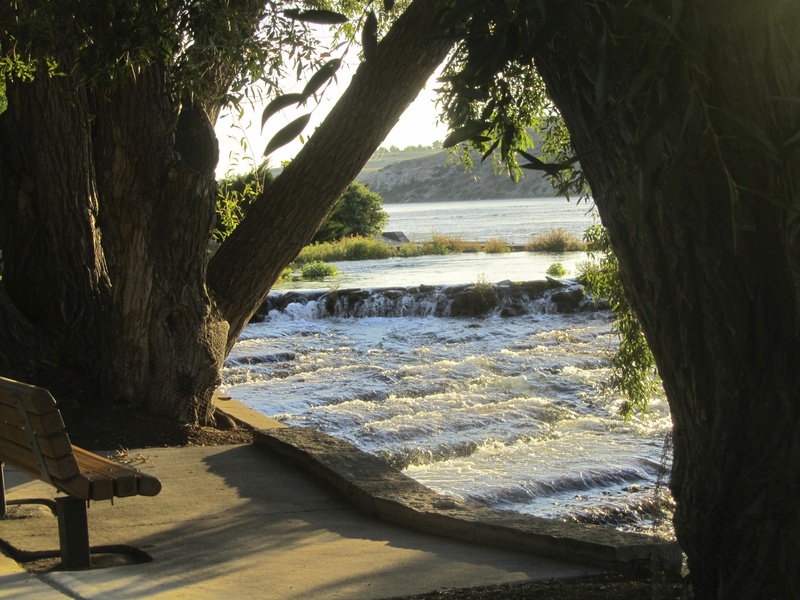 The Missouri River flows through Cascade. This is the river followed by Lewis and Clark, the explorers in the early 1800s. The river is very peaceful in good weather. This view from a bridge also shows a small island in the river. Cascade was great town with friendly people. I like Cascade, Montana.